Marshalls Jewelers has been around since 1889, and after more than a century of doing business in San Luis Obispo, it's slated to close its doors at the end of the year. "I can't tell you how many tears have been shed on both sides of the counter," owner Jeff McKeegan said. NEW VENTURES Marshalls Jewelers is closing its doors after 129 years of doing business in San Luis Obispo. The business specializes in custom design and manufactured jewelry in platinum and gold, cut diamonds, and fine colored stones. On Nov. 14, the jeweler started its liquidation sale, where customers can find pieces with a discount of 50 to 70 percent off. McKeegan said the store will remain open until he runs out of merchandise, which he predicts will be the end of the year. The decision to close the store came to McKeegan as he began researching what retirement would look like for him and what the fate of the store would be. He started the process about two years ago and without anyone to pass the business on to, the next step for the store was to close. "I've got to tell you through the whole process I've been very nervous. You know questioning whether this is the right decision," he said. McKeegan is the fourth hand in the long history of the store. Manuel Marshall first opened the business in 1889 on Monterey Street. His son Art Marshall took over the business and then sold it to his cousin Clifford Chapman, who moved the store to its current location in 1972. When Chapman took over the business, it was lackluster, as Art wasn't as interested in jewelry. 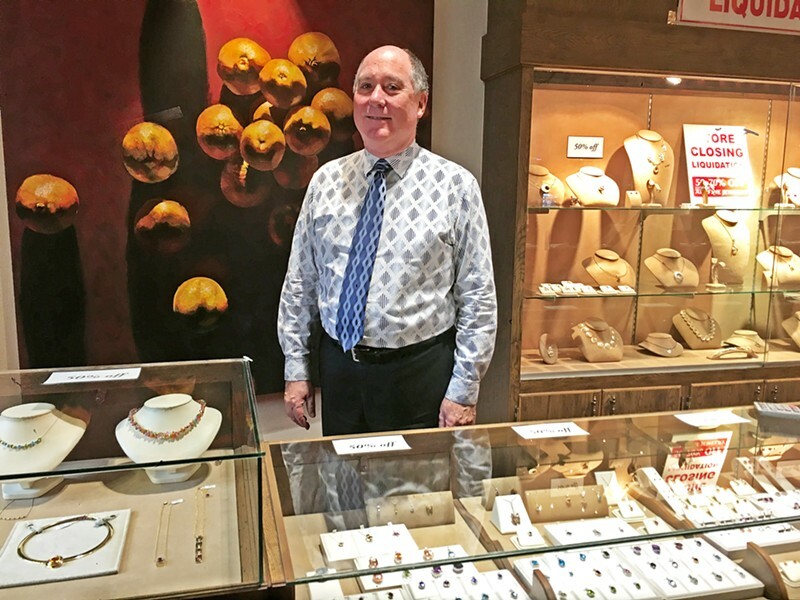 McKeegan said Chapman cultivated an upscale inventory of jewelry to revitalize the store. In 1981, McKeegan started working at Marshalls Jewelers and ultimately bought the business in 1993 with a business partner. One of the things McKeegan learned is something that he'll take with him beyond the jewelry store—people are important. "That puts a tremendous responsibility on you, but it's also the wonderful part of doing this. I love working with the public, and that's what this is all about," he said. Although the store is set to close, McKeegan holds onto the thought that someone might come around to continue the business's legacy. "There is a part of me that hopes that someone will show up and be interested in carrying it on, because I am not happy being the one that closes this 129-year-old business," he said.